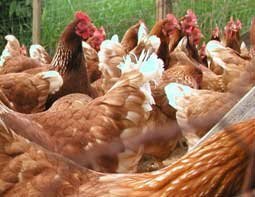 IBM has developed radio frequency identification (RFID) tracking technology to track chickens from farms to supermarket shelves. The supplier is working with a Norwegian food producer Nortura to build a proof of concept item-level tagging application for the food industry. RFID has been used successfully to track animal movements, such as the movement of cattle during the BSE outbreak, and to protect high-value items such as whisky and clothing, But it is unusual to find examples of item-level RFID tagging in food production, according to Stefan Pique, European director at GS1, the supply chain data standards body. IBM worked with Matiq, the IT subsidiary of Nortura, to use RFID to track and trace poultry and meat products. Product packaging will be tagged with RFID chips to help ensure that products are kept in optimal conditions throughout the supply chain, Matiq said. The system at Matiq will be based on IBM's WebSphere RFID Information Center, a system for tracking RFID tags in the supply chain, which uses the GS1 EPCglobal's Electronic Product Code Information Services (EPCIS) standard. To access the supply chain information, Norwegian food suppliers and supermarkets will also need to run software that supports EPCIS. Matiq has also researched how to provide shoppers with more information on the meat they purchase. Are Berquist, chief executive officer of Matiq, said, "We have looked at providing trace information on lamb, which provides data such as where the sheep has lived and the type of food it has eaten." The information is used to show the quality of the meat. To access this information, shoppers use the camera built into their mobile phone to scan the barcode on the meat packaging.